How experienced are you with spreadsheets? When creating a new sheet you’re asked to select a template. You can choose from a variety of templates to get started with your Tiller Sheet. Some templates are more barebones, like the Raw Data template, for those who want to experiment with creating their own charts and reports and might be more experienced with spreadsheets. Some others we offer have built in reports and features such as weekly spending analysis, a budget worksheet, or a net worth tracker for those who might not be as comfortable building customized reporting and budgets on their own. Review our Template Resources help collection to learn more about each template. 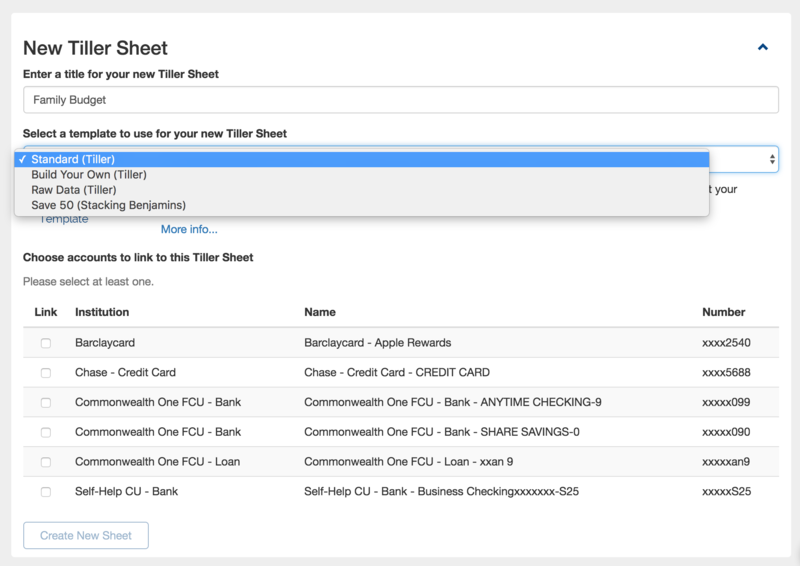 No matter which template you choose Tiller will pull in transaction data for any accounts you have linked to the sheet. You can start with any template you want and have the freedom to customize the template any way you like. Tiller keeps original transactions in the database. Changes to sheets don't create changes to the database, and new sheets start with a fresh copy of the original data from the database. If you don’t like the template you can simply unlink the sheet from your Tiller Dashboard and start fresh with a different template. If you want to transition to a new template and include customized transaction data you can copy it from an existing sheet and paste it into the new sheet.